Relief Rx™ (100 ml) is a completely new type of product that provides almost immediate relief from muscle and joint discomfort. And unlike many rub-on analgesics, the unique combination of ingredients in Relief Rx sooth and nourish the skin. Oil free. Can even be used to provide soothing relief from sunburn! Two thumbs up from The Healthy Skeptics. You will be amazed ~ Because Relief Rx is non-irritating, it can be used multiple times a day to handle serious discomfort. Workouts made easy ~ Relief Rx is your pre/post workout solution. 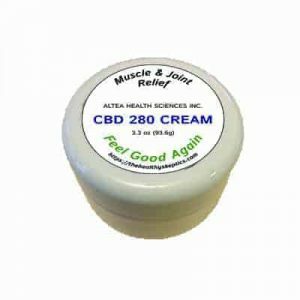 Runners, golfers, weightlifters, yoga practitioners, physical therapists, personal trainers, chiropractors, massage therapists and other active lifestyle professionals have found Relief Rx to be extremely effective. in our collection, aloe is number 1, for it’s wide range of benefits, safety and efficacy. 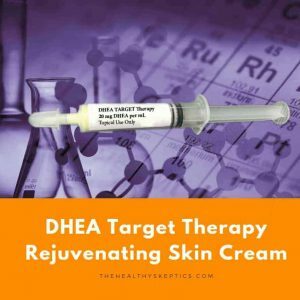 It plays a dual role in this formulation: soothing and healing for the skin, and as a carrier to deliver the other active ingredients into the areas where they can do the most good. 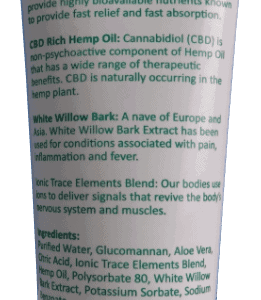 Hemp Oil: In the late 1980’s scientists were surprised to find that many tissues in the human body have receptors or binding sites for plant compounds known as cannabinoids or CBD’s. This large group of receptors, now known as the endocannabinoid system, influences regulatory mechanisms including mood, sleep, appetite, pain and immunity. 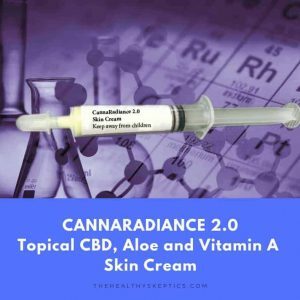 Since the hemp plant is currently the only plant species with high levels of CBD’s, a great deal of research is now being conducted on the benefits of CBD-rich hemp oil. Importantly, the oil used in Relief Rx contains no psychoactive compounds. White Willow Extract: Wilow extract contains salicin, which has been used for thousands of years, and its topical application has been researched extensively in regards to pain, inflammation and the aging process. Ionic trace Minerals: An ion is a mineral or element that has a positive or negative charge. That means the element has either too many or too few electrons. This unstable ionic state allows the element to bond readily with water, and to provide electrical “signals” that contribute to the effectiveness of Relief Rx. Int J Cosmet Sci. 2011 Oct;33(5):416-20. doi: 10.1111/j.1468-2494.2011.00645.x. Salicin [from white willow] regulates the expression of functional ‘youth gene clusters’ to reflect a more youthful gene expression profile. Gopaul R1, Knaggs HE, Lephart J.
J Cosmet Dermatol. 2010 Sep;9(3):196-201. doi: 10.1111/j.1473-2165.2010.00512.x. An evaluation of the effect of a topical product containing salicin on the visible signs of human skin aging. Gopaul R1, Knaggs HE, Lephart JF, Holley KC, Gibson EM. J Altern Complement Med. 2017 Jun 15. doi: 10.1089/acm.2017.0047. Successful Treatment of Acute Radiation Proctitis with Aloe Vera: A Preliminary Randomized Controlled Clinical Trial. Sahebnasagh A, Ghasemi A, Akbari J, Alipour A, Lashkardoost H, Ala S, Salehifar E.
Transdermal cannabidiol reduces inflammation and pain-related behaviours in a rat model of arthritis. Hammell DC, Zhang LP, et al. Eur J Pain. 2016 Jul;20(6):936-48. doi: 10.1002/ejp.818. What is the shelf life of the ReliefRX ? And how long does it last once open ? And can it be stored in the fridge ?